Call BCG Management for your office, retail or commercial window cleaning, and let the sun shine in! We'll remove the grime and dirt from your windows inside and out. We'll clean your screens and sills too. For spotless window cleaning, call BCG Management and find out why we're the area's preferred commercial window cleaning company. Estimates are always free, and can often be given over the phone. Just let us know the type and quantity of windows you would like to have cleaned and we'll come up with a reasonable and competitive price. 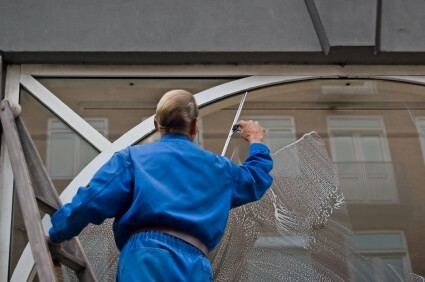 We'll first give you a fair and competitive estimate for your window cleaning project. Next, we'll scrub off dirt and grime without scratching the glass. We'll clean your screens and wipe down the sills. Excess water will be removed from the glass with a squeegee for streak less, spotless drying. The end result is a sparkling clean window! Our window cleaners complete cleaning projects on time and within budget. For a fast window cleaning turn around that won't break the bank, call BCG Management today. We'll have your building windows sparkling again in no time!